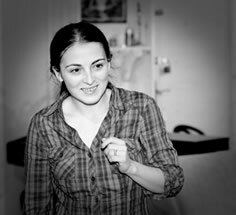 Ana Mărgineanu is a force a nature, a brilliant theater artist. Both an innovator and director, Ana’s most recent two projects — Hotel Project and The Window — are site specific theater pieces at opposite ends of the spectrum. The Window, which opened last night at the Romanian Cultural Institute in New York’s gallery storefront window (Third Avenue at 38th Street), offers passersby the chance to glimpse a new piece created by Obie Award winners American playwright Samuel D. Hunter and Romanian scenic designer Nic Ularu along with Ana. Walk by the corner of Third Avenue and 38th Street between 7:30 pm and 10:00 pm April 2 through 8, 2012, and you will be treated to a mesmerizing performance that repeats every 20 minutes. Pieces like The Window are the reason people live in New York: to be very close to artistic invention and exploration. Imagine turning a corner and seeing an unexpected performance. It’s exciting, refreshing, invigorating even. Works by Women spoke with Ana the night before The Window opened about what excites her about site specific theater, the women who inspire her and what New Yorkers may expect with The Window. WBW: What excites you about site specific theater? AM: First I think the space itself, coming with its own story and with different challenges than a theatre. Then, you reach different audiences while doing site specific performances. Sometimes like with The Window, you rely on “accidental audience members,” the people who are just passing by. Last night at the dress rehearsal it was raining hard so I didn’t expected anyone to stop. It was amazing to see a group of people trying to get a cab and getting so absorbed by the performance so when finally a cab stopped, they let it go and stayed to continue watching the performance in the rain. “Dude, this is awesome, what is it?” asked one, after letting the taxi go. “I think it’s art” answered another one not very convinced. The feeling I had watching this little scene is indescribable. WBW: How is The Window different from previous site specific theater pieces you’ve created? AM: The last site specific show I did was Hotel Project, and the biggest difference is the number of spectators allowed to see the performance. Hotel Project is an one audience member at a time type of show – creating an incredible intimate, exclusive experience. At the opposite end, The Window is open (and free) to anyone who wants to watch. You don’t have to buy a ticket, you don’t need a seat, or a reservation, you just come by. Also, because the show is silent, people feel encouraged to talk and share their thoughts during the performance. Reactions are very different, sometimes they make up lines for the actors, or they are trying to translate the scenes for each other. Most of the times they just ask a lot of questions, even there is no one to answer. A couple of times in the rehearsals, people tried to interact with the actors and get inside the space. They knocked persistently in the window, asking to be let in. They wanted to be inside the show. I guess this performance will become more of an social experiment then any other show I did before. WBW: Tell me about working with playwright Samuel D. Hunter and designer Nic Ularu. AM: Oh, it’s been such a pleasure. They are both truly wonderful. Sam has an incredibly sensibility, which I believe translates beyond words. And Nic, he’s a very hands on person, paying attention to the smallest detail. It was my first time collaborating with both of them and I hope we will work together many times from now on. WBW: What should audiences expect in their experience of The Window? AM: I don’t know. I always imagined when conceiving The Window, that as a passenger, going home after a day of work, you walk by, and there is a lighted window, with a strange, magical world inside. And you stay and watch as much as you want and then you continue your journey into your life. AM: Another The Window in May. This time, I will collaborate with set designer Daniela Kamiliotis and playwright Saviana Stanescu. All together we will imagine a complete different spectacles in the same window. I’m very excited. And then in the summer, I will work a bit in Europe. My show done in Romania last year, “Playful Targoviste”, has been invited to close the New Plays From Europe Theater Biennale Wiesbaden 2012, so I will spend part of June in Germany. And after, hopefully together with Tamilla Woodard I will do another Hotel Project in Spain, in July. AM: Not different at all from the challenges men are facing. So far, I never felt I was more (or different) challenged then my male colleagues. Call me lucky. WBW: What gives you hope for women in theater? AM: They are so strong. The strongest people I know are women. I have a ton of examples: the director of The Romanian Cultural Institute in New York, (who is presenting The Window) – Corina Suteu – is an incredible woman, and because of her (and a wonderful team composed mostly by women) the Institute is doing an amazing job promoting Romanian culture. One of the reasons they are so successful is (in my opinion) the fact that Mrs. Suteu is not afraid to take risks. My partner in doing Hotel Project and colleague from The Internationalists, Tamilla Woodard – it’s just inspiring to watch her work. My mom (the strongest woman i know). And I could continue for pages. The women today are inspiring, and watching them gives me hope. Plus, some of us (like myself) are lucky to have the support of an amazing husband. That helps. The Window runs April 2 – 8, 2012, 7:30 pm to 10 pm every 20 minutes, at the Romanian Cultural Institute in New York (573-577 Third Avenue at 38th St.). 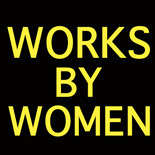 This entry was posted on April 3, 2012 by worksbywomen in Interview, Theater, Women and tagged Ana Margineanu, Romanian Cultural Institute in New York.